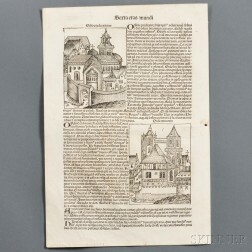 Save your search - find out immediately when "the Nuremberg Chronicle" is available at auction! 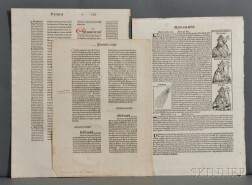 Leaves from Incunabula, Early Printed Books, and Fine Printing, Approximately Thirty-eight Leaves. 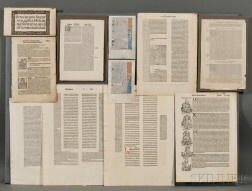 Manuscript and Nuremberg Chronicle Leaves, Four. 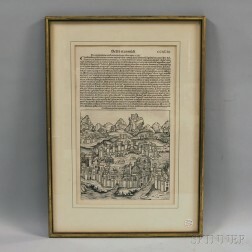 Woodcuts, Engravings, Illustrations Cut from Books, Approximately Forty Pieces, 15th-19th century. World Map. Hartmann Schedel (1440-1514) Das Ander Alter der Werlt. Nuremberg Chronicle, Liber Chronicarum [Latin Edition], Leaf IX, Hand-colored. 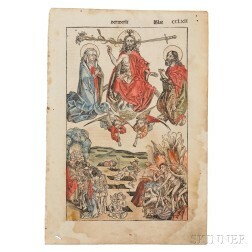 Nuremberg Chronicle, Liber Chronicarum [German Edition], Leaf CCLXII, Ultima Etas Mundi (The Last Judgment) , Hand-colored. Incunabula and Early Printed Book Leaves. 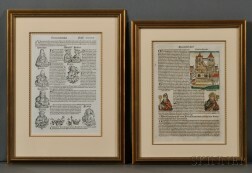 Incunabula Leaves, Nuremberg Chronicle, Two Framed Leaves, One Hand-colored.